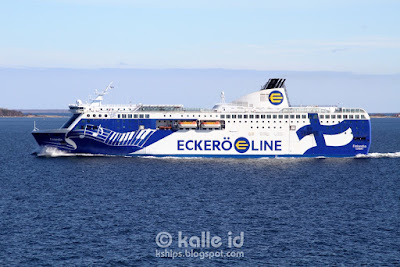 I realised recently that I haven't posted any exterior photos of the Silja Europa since her late-2016 return to the Helsinki-Tallinn 22-hour cruise circuit, and that there is no up-to-date history of her in this blog. So today, we will look at some photos of the SE from last summer. The Silja Europa was originally ordered by Rederi AB Slite, one of the owners of Viking Line, in 1989. The Europa, as she was to be known (in keeping with Slite's tradition of taking their names from Greek and Roman mythologies), was to be the jewel in the company's crown, outdoing both SF Line's (the other Viking Line partner) Cinderella and Silja Line's still-under-construction Silja Serenade and Silja Symphony. In terms of basic design the Europa is an enlarged version of the Athena and Kalypso, built in 1989 and 1990 respectively (they in turn were based on the Mariella of 1985 and her sister Olympia of 1986). While the Europa was under construction at Meyer Werft, a disaster struck the Finnish shipbuilder Wärtsilä Marine, who were building both Slite's Kalypso and Silja's Serenade and Symphony. Wärtsilä Marine went bankrupt and in the ensuing reorganisation the prices of the still under construction newbuildings rose radically, leaving both Slite and Silja Line in heavy debt. Fast forward to January 1993. During the month the Swedish krona (SEK) was devaluated by 25%, leaving Slite 200 million SEK short of the price of the Europa just two months before the ship was to be delivered. The situation was further compicated by the fact that the main funder of Slite, Nordbanken, was also the main funder of Silja Line. While Slite was better off financially of the two, the bank stood to lose more if Silja folded (as it perhaps seemed likely to do at the time). Regardless of what the actual reasons were, Nordbanken refused to grant Slite an additional loan to secure the Europa. 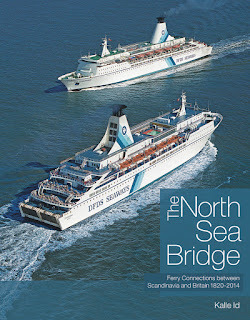 During the same month Silja Line signed an agreement with the shipyard to charter the Europa on completion of the ship. Slite's assests, meanwhil,e were evaluated by Nordbanken as being much less valuable than they were. 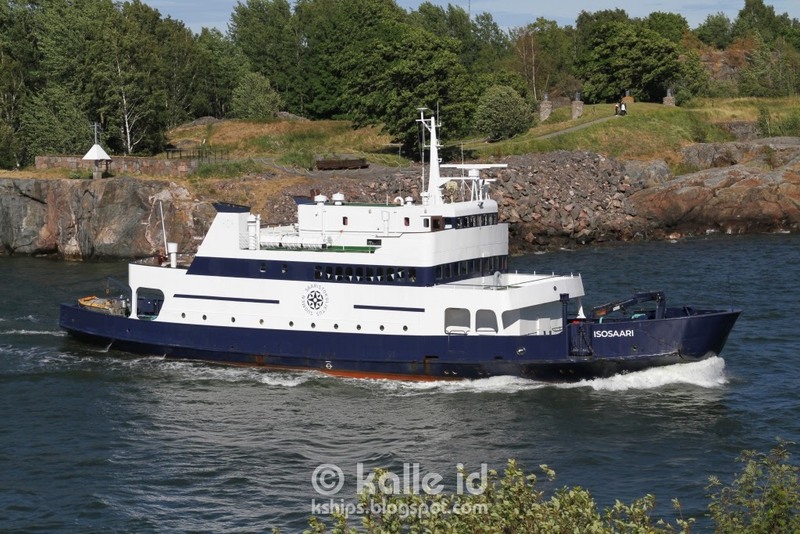 The result was that Slite was forced to declare bankruptcy and their remaining assets (Olympia, Athena, Kalypso and a pair of small achipelago cruise ships operating in Stockholm) were sold, the big ferries for trading outside the Baltic. The money from selling the ships easily covered the debts of RAB Slite, in essence meaning the bankruptcy was unwarranted. With large parts of Viking Line's fleet missing, Silja Line established itself as the dominant shipping company on the North Baltic and managed to somewhat improve it's financial position. Returning to the Europa, she has been christened Silja Europa on 5 March 1993 and entered service on Silja Line's Helsinki-Stockholm route on 14 March 1993. 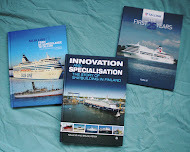 She had been planned for that exact route, and placing her on the service allowed Silja to cash in on the large-scale marketing Viking Line had already carried out for the ship. In 1994 the Silja Europa was the second ship to arrive on the scene of the Estonia disaster and was appointed head of the rescue operation. In practice Silja Line found the Silja Europa to be ill-suited as a running mate to the Silja Symphony. 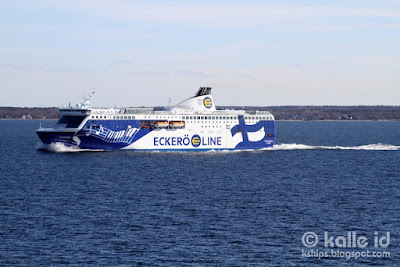 More importantly the Silja Serenade – which the Silja Europa had replaced on the Helsinki-Stockholm service – was found to be highly ill-suited for the Turku-Stockholm service, where she had been trasferred to make way for the Silja Europa on the Helsinki-Stockholm route. Resultingly, from January 1995 the Silja Europa moved to the Turku-Stockholm service, with the Silja Serenade returning to the Helsinki-Stockholm route. Originally the Silja Europa had a partially white funnel, with the seal painted on on blue. However, as there was a tendency for soot to gather in the white part, in 2000 the funnel was repainted all-blue, with the Silja funnel symbol painted on in white (since 1993, both blue-on-white and white-on-blue variants had been used). 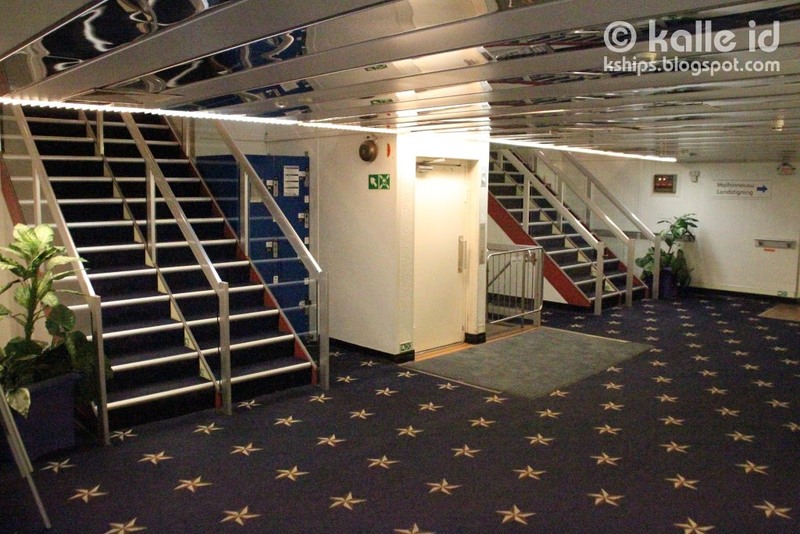 In 2002, Stena Line were reportedly interested in chartering the Silja Europa to replace their Stena Saga (some claim the staff of the Stena Saga even visited the Silja Europa to get to know her). Resultingly Silja Line's then-owner Sea Containers purchased 42% of the ship from Meyer Werft, which together with the previously Silja-owned 17% gave them a majority ownership and blocked the transfer to Stena. In 2004 Sea Containers purchased the remaining shares of the ship. 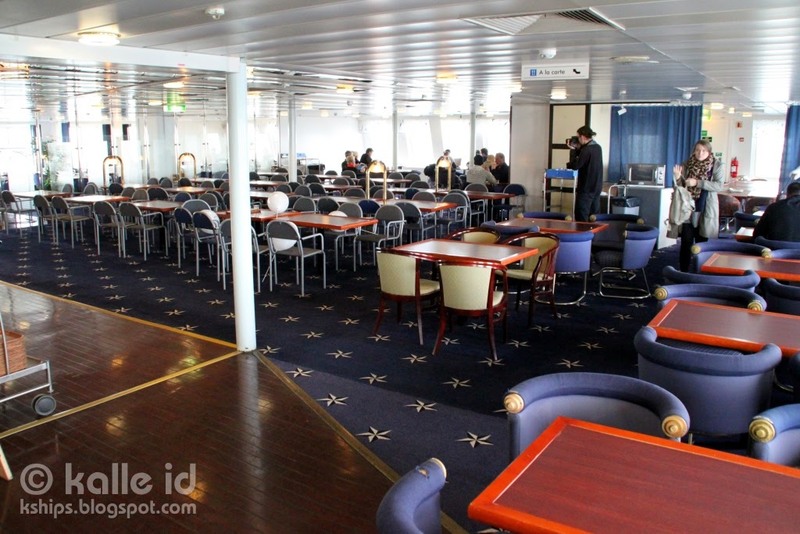 In 2006, prior to Silja Line being sold to Tallink, the ownership of the ship was passed entirely to Silja Line. The Silja Europa had for a long time suffered from engine problems, which are particularly problematic on the intensive Turku-Stockholm route. 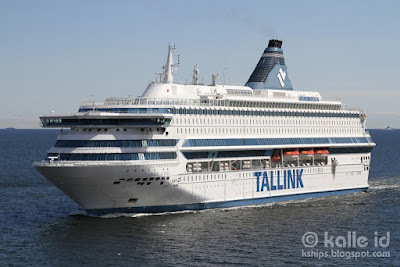 Compounded with the arrival of Viking Line's new Viking Grace on the Turku-Stockholm line in January 2013, Tallink swapped the Silja Europa with the Helsinki-Tallinn 22-hour cruise ship Baltic Princess in January-February 2013. The Silja Europa was transferred under the Estonian flag and marketed as a Tallink ship (although retaining her Silja-prefixed name). 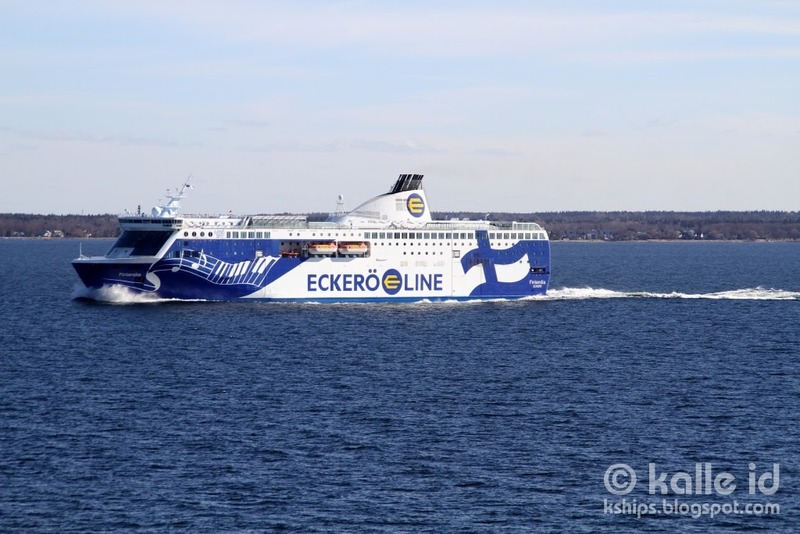 She entered service on the Helsinki-Tallinn route on 23 January 2013. 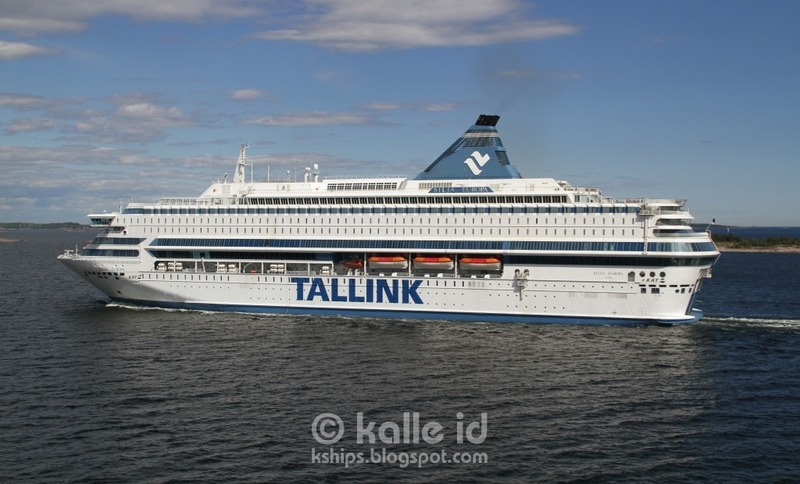 Initially, she was marketed in Finland as the Europa, in an attempt to maintain a degree of separation between the Tallink and Silja brands, but as all signage, announcements etc onboard continued to refer to the ship under her full name, the practice was quickly dropped. The ship remained in Tallink service without incident until July 2014, when her owners took the shipping world by surprise when they made public the agreement to charter the Silja Europa to Bridgemans Services as an accommodation vessel to Australia for 14 months (with a possible extension to 48 months), starting from August. Thus, the Silja Europa sailed to Naantali for conversion to an accommodation ship. At the same time the ship was repainted with Bridgemans logos on the hull. After the refit the ship left the Baltic Sea on a lengthy transition to Barrow Island in northern Australia. 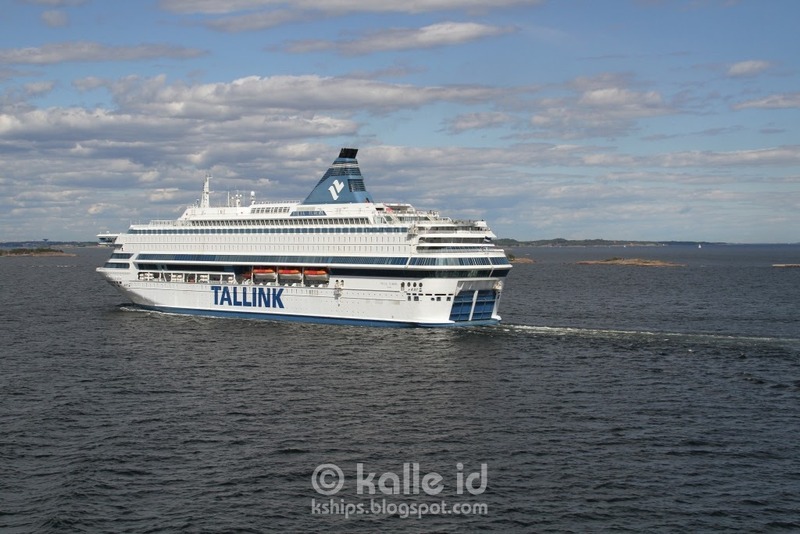 She was replaced on the Helsinki-Tallinn 22-hour cruise circuit by the Baltic Queen. Most observers (myself included) expected this to be the last that we would see of the Silja Europa on the Baltic. And we were all wrong. 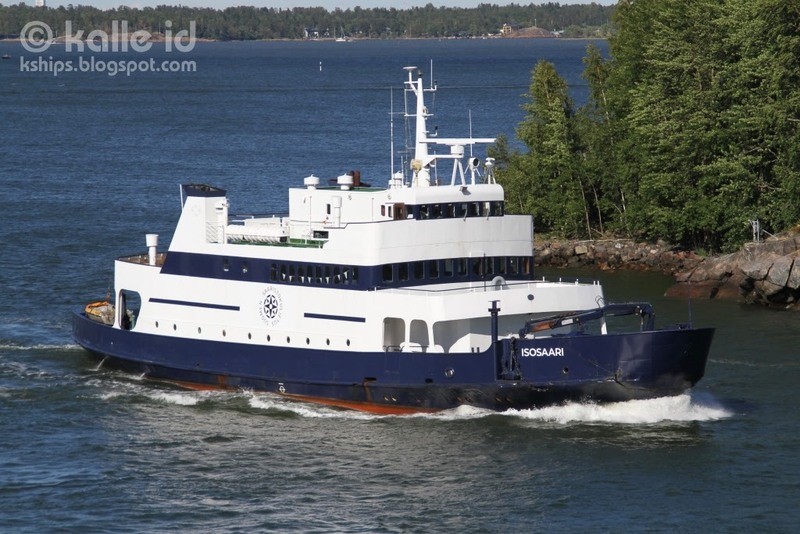 When the charter ran out at the end of 2015, the ship sailed back to Tallinn (although rumour has it potential buyers inspected her in Singapore en-route) and received a partial refit. 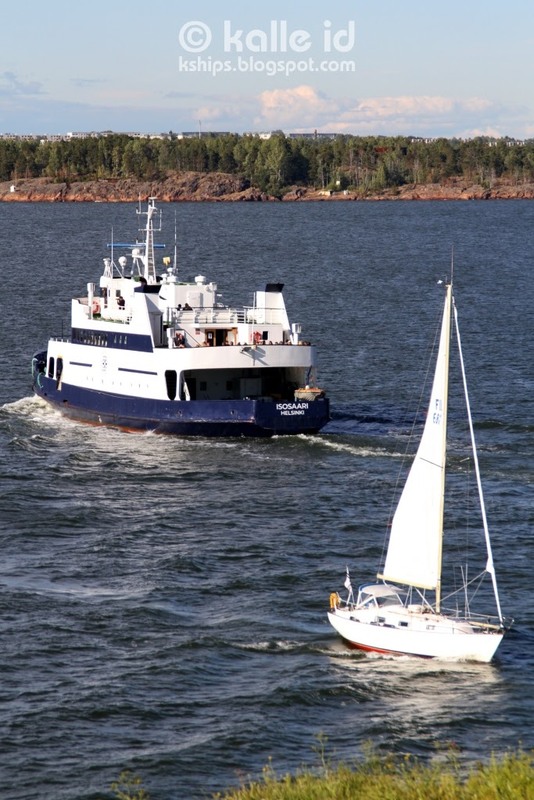 After covering for docking periods of other ships, she returned to the Helsinki-Tallinn route for the summer season on a somewhat anarchronistic schedule: day cruises, departing from Helsinki in the morning and returning in the evening (some English-language sources mistakenly claim she was used on the 22-hour cruise circuit alongside the Baltic Queen – a misunderstanding presumably arising from the fact Finnish has two different terms that translate into a English as "day": "päivä", meaning the period from morning to evening, and "vuorokausi", a 24-hour period. Thus, "päiväristeily" and "vuorokauden risteily" both translate as "day cruise", but are completely different products). 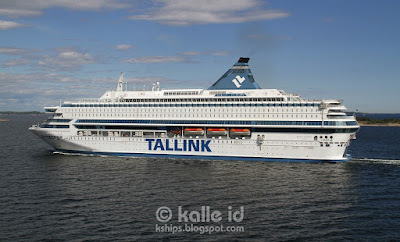 Unusually, she sailed not from the Tallink terminals in Helsinki's Länsisatama (West Harbour) but from the Silja Line terminal in Eteläsatama (South Harbour). At the end of August 2016, the Silja Europa was laid up at Muuga, the freight harbour of Tallinn, for a large-scale refit, with all public rooms (except the ones done the previous spring), cabins, staircases, corridors, etc. rebuilt. Following the refit, the ship re-entered service on the 22-hour cruise circuit between Helsinki and Tallinn in December, replacing the Baltic Queen. For an overview of the current interiors, feel free to look at this entry. And that pretty much brings us to the present: the Silja Europa remains on the Helsinki-Tallinn 22-hour cruise service, complemented with two-night special cruises to Visby, Riga and Mariehamn during the summer seasons. The photos below show the Silja Europa inbound outside Helsinki, photographed from onboard the Finlandia sailing in the opposite direction. As per normal practice, click on the images to see them in larger size. Still looking every inch a Silja Line ship, even with Tallink logos. I've often thought they would be smart to cash in on the ship's perceived special status by just painting her name in large letters on the side in place of the Tallink-text. 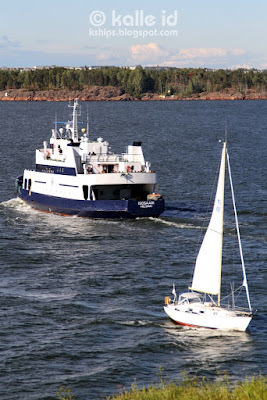 The Finlandia and Silja Europa pass just on the edge of the Helsinki archipelago, giving impressive views. Always nice when you get sun reflecting from the windows. She is a bit of a chunky lady, to be honest. But I for one like my ladies that way. She has a lovely rear, too. Okay, I'll stop with the questionable puns now. 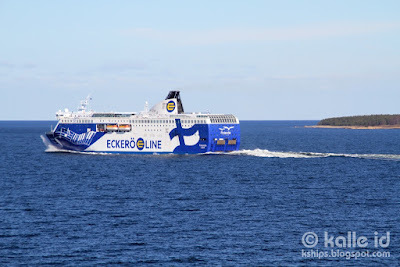 Before we move to the main attraction of today's entry, I would like to take a chance to showcase two articles I did this month for a new customer, Ferry Shipping News: I had the chance to interview both Björn Blomqvist, the managing director of Rederi Ab Eckerö (who of course own Eckerö Linjen, Eckerö Line and Birka Cruises), and Jan Hanses, the president and CEO of Viking Line, with both offering fascinating insight on how they view the ferry industry in their business area. You can read the interview with Eckerö's Blomqvist here, and Viking's Hanses here. Both also showcase some of my photography (that is already familiar to the readers of this blog, of course). 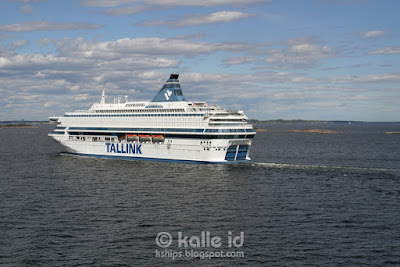 Today's entry, by chance, is related to both companies mentioned: I was out on a day cruise with the Viking XPRS to Tallinn earlier this week, and took these quite neat photos of the Finlandia on the Bay of Tallinn as she was outbound and we were inbound. * = The berths figure is for the ship as originally built. In 2015, a number of cabins were converted into public rooms, so this figure is no longer correct, but none of the sources at my disposal were able to provide an up-to-date figure. 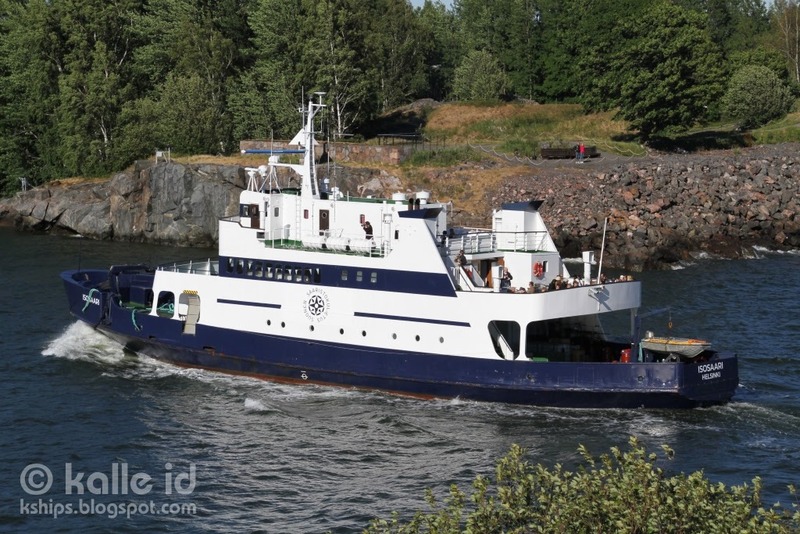 For a history of the Finlandia, see this earlier entry on her. 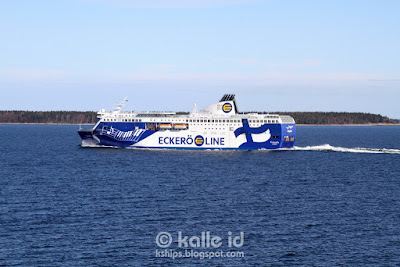 As said above, the photos below show the Finlandia on the Bay of Tallinn on the early afternoon of 26 March 2019, outbound from Tallinn towards Helsinki. Photographed from onboard the Viking XPRS sailing in the opposite direction. As per the usual, click on the images to see them in larger size. The ship does look immensely better with the frames of the large forward-facing window painted blue. She might look even better if they added a blue stripe along the bridge windows, too. If you look closely, you'll notice the small Finland 100 logo (which used to be above the piano keys) has been replaced by an Eckerö Line 25 Years one – the company will have its anniversary in late August. I really like this shot myself. The seagulls and the ship's name they added in the previously blank blue part in the rear last year also make the ship look better. To start off, I must apologise for the longest hiatus in the history of this blog. Both my work and my personal life has been really hectic of late, and the blog has been an easy thing to drop off. Things are looking a bit easier in the near future and I will hopefully be able to return to a more normal update frequency. 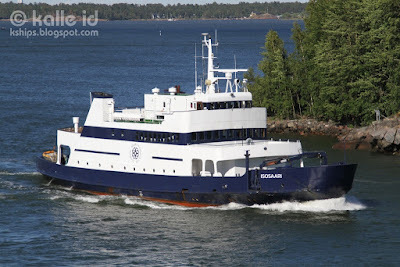 For today's entry, we will be looking at a something of an unusual ship for this blog: the Isosaari, a local ferry connecting central Helsinki to the outlying island Isosaari. I've been sitting on these photos for some time, and the reason why I was inspired to post them today is the fact that the miniature Isosaari is slated to become a cruise ship this year – it will make one two-night cruise from Helsinki to Turku via Jussarö and Örö, and another one with reverse itininerary in early May. Both cruises will be all inclusive, even! So let's take a brief look at the history of one of the smallest premium cruise ships out there! The Isosaari was originally built in 1967 by the Ankerløkken Værft in Florø, Norway as the Norwegian local ferry Sveio for Hardanger Sunnhordlandske Dampskibsselskab. As built, the ship had a drive-through car deck for 30 cars and a passenger capacity of 350. After lengthy service in Norway, it was sold in 1995 to Suomen Saaristolaivat in Turku, Finland and, despite being 28 years old, rebuilt at Pansion Korjaustelakka in Turku, with new passenger areas built into most of the former car deck. 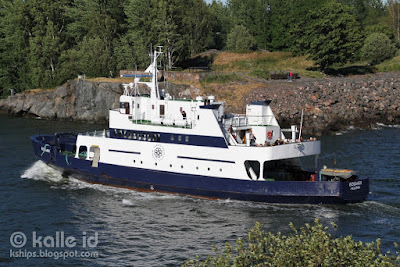 At the same time, the superstructure was made lower to keep the gross tonnage below 500 (as ships of under 500 gt can follow different crweing rules than bigger ships) Renamed Aspö, the ship then started service in the Turku Archipelago, linking to the outlying island of Utö. In this role the ship remained until spring 2018, when it was sold to Suomen Saaristokuljetus in Helsinki, who had a dual role in mind for the ship: it both links Kauppatori in central Helsinki to the island of Isosaari, and functions as a hotel ship in Isosaari during the summers, and as a hotel ship and restaurant in central Helsinki during the winters. 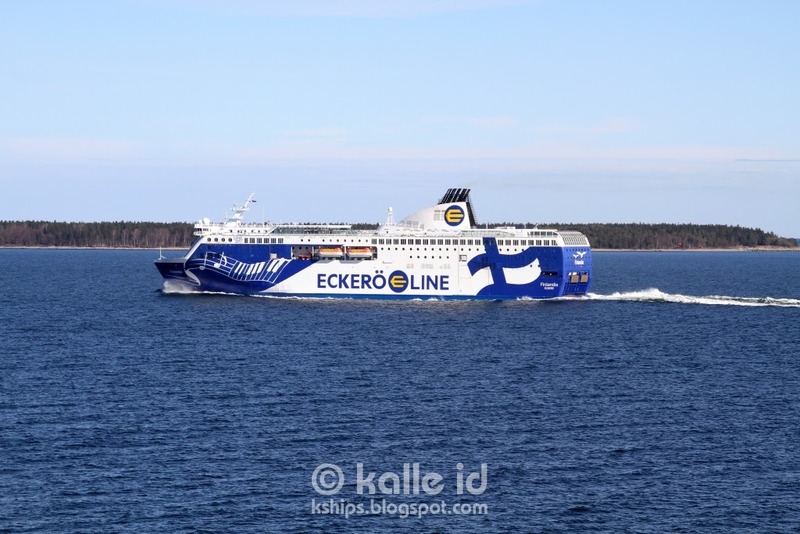 In March 2019, Suomen Saaristokuljetus made known that the ship would offer the two all-inclusive Helsinki-Jussarö-Örö-Turku cruises mentioned above, as a test for the potential demand for further such cruises in the future. The photos below show the Isosaari on the afternoon and evening of 23 June 2018 in the Kustaanmiekka strait, in the first two photos outbound from Kauppatori towards Isosaari and in the second two sailing in the opposite direction. As per normal practica, click on the images to see them in larger size. 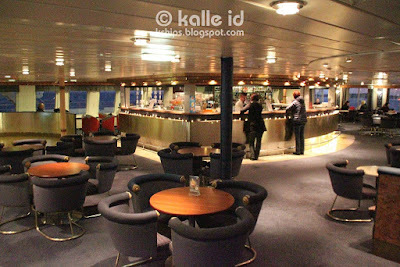 Apparently, the ship has a pretty attractive 1960s style interior. I wouldn't know, I haven't sailed on it yet. In 2019, the Isosaari will also connect to Vallisaari, the island seen in the background here. An hour later, the ship is in the same spot but bound in the other direction. Kships will return. Hopefully sooner than in a months' time. Edited 2019-03-09 20.47 with additional information about the ship's 1995 refit, courtesy of Miran Hamidulla. I am happy to finally officially announce that this year will see the publication of another book by me. The North Sea Bridge – Ferry connections between Scandinavia and Britain 1820-2014 will, es the name suggests chronicle the history of the passenger ferry services between Scandinavia and Britain (plus Finland and Iceland to Britain) from the beginning of regular scheduled services right until the closure of the last passenger link in 2014. Those of you who speak Finnish might be familiar with my very long article series on the same subject in Ulkomatala, published in 2015-2016; the book will be a translated, expanded and generally improved version of the article series. Projected publication will be in December this year, while the projected page count will be 160. For the most eager amongst you, the book can already be pre-ordered from the Ferry Publications website here. Happy belated new year to all Kships readers! There was a bit of a hiatus over christmas and new year, as you probably noticed – in addition to being "regularly busy" with the festivities, there were also other issues of a personal nature that kept me from the regular update schedule. But now we're back and hopefully will be back to the weekly updates. 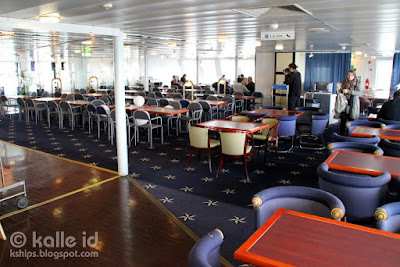 Today, we will look at an older photo set that, for some reason, I neglected to post when it was brand new: interiors of the Wasaline Vaasa-Umeå ferry Wasa Express from my & Bruce Peter's trip onboard her back in 2014. For those interested, the history of the Wasa Express was covered in a previous entry, which also includes my (so far only) exterior shots of her. 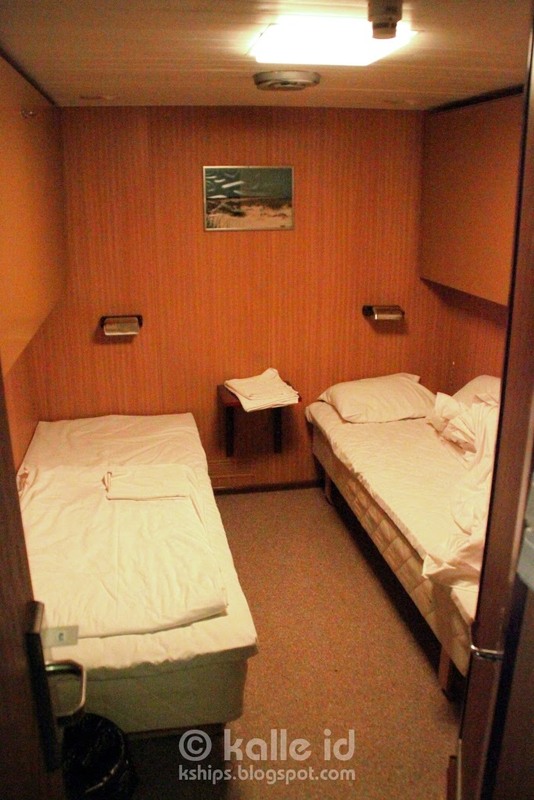 Before making judgements on the Wasa Express based on this entry, please remember that the photos are from 2014 and many of the interior spaces have since been refurbished. 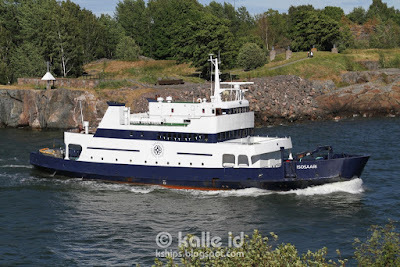 Wasaline are, of course, planning a replacement for 2021 delivery – I guess I will need to do another trip to Vaasa before then and document the Wasa Express again. 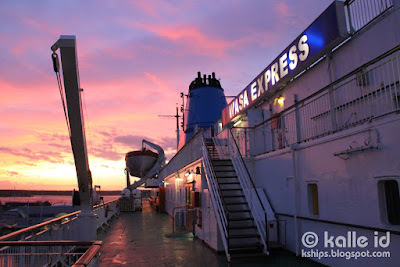 Not an unpleasant prospect, as the service and food onboard were some of the best I have encountered on any ship, even if part of the ship were, at least at the time, in need of some TLC. Decks 9-11 – all passenger spaces onboard the Wasa Express are found on decks 7 and 8. Above are the bridge (on deck 10), crew spaces and open decks accessible to passengers. Sunset at Holmsund (Umeå's outer harbour) as seen from deck 9 of the Wasa Express. 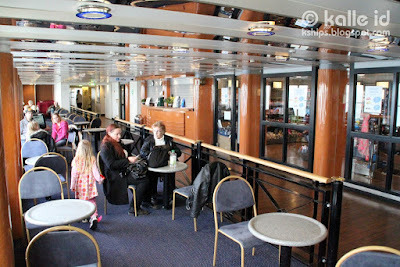 Deck 8 – back in 2014, this deck had the bar forward, passenger cabins amidships, and kennels, conference rooms and the children's playroom aft. Since then, the aft areas have been reorganised so that there is now a sitting lounge and an extra-cost business lounge there in addition to the kennels and conference rooms. The bar occupies the entire width of the ship forward. Since 2014, this had been rebuilt with the bar counter moved away from the view-blocking central location and is now just behind the photographer's back in this view. The chairs have also been swapped for new ones. 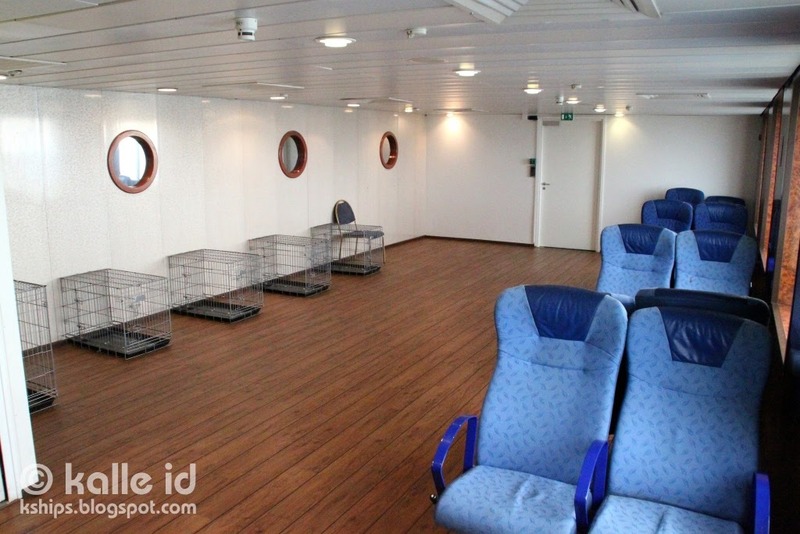 Midships there are a total of 60 cabins. The kennel as it was back then. The chairs have since been swapped for new ones. Unfortunately, the rest of the aft area were closed (and I didn't want to intrude on the kid's playroom), so I can offer you no other shots of this part of the ship. 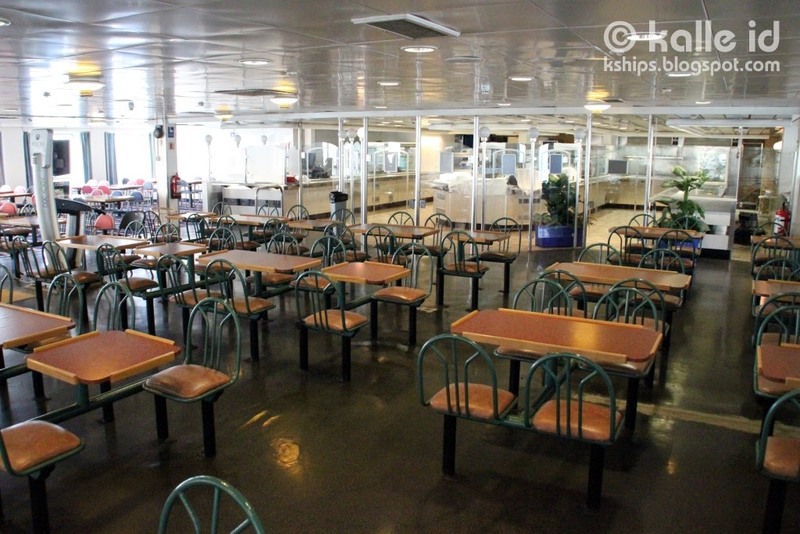 Deck 7 – here were (and still are) the cafeteria, à la carte restaurant, shop and the information booth. New additions since 2014 are the children's playroom (moved down here from deck 8) and buffet restaurant, which replaced the (at least on my trip unused) second cafeteria aft. The cafeteria had a wonderfully eclectic collection of chairs from the ship's career back then. Perhaps fortunately, they have since been replaced with new ones and are now all of a uniform design. 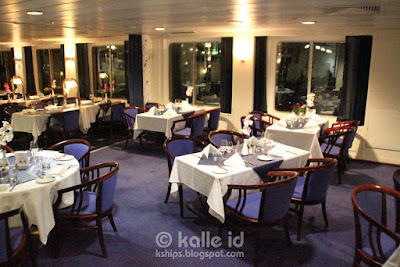 The Vitfågelskär à la carte restaurant served some of the absolutely best, locally-inspired cuisine I have ever eaten onboard any ship (and yes, this includes your luxury cruise ships like the Crystal Symphony). The sea buckthorn panna cotta was to die for – and I don't even normally like panna cotta. Midships, a starboard arcade connects the forward and aft restaurants. The glass doors on the right led to the small onboard shop, but this has since been replaced by the kid's playroom and a new, larger shop has been added aft. 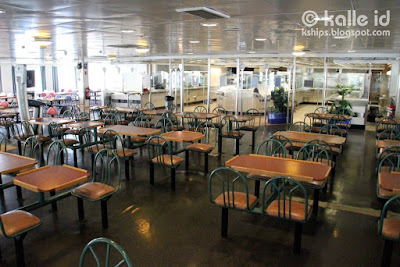 As was typical for Wärtsilä-designed ferries at the time, the galley occupies the same space port, serving restaurants both forward and aft of it. The aft stair lobby, which also serves as the entrance foyer. The (unused) aft cafeteria has since then been completely transformed into a buffet restaurant – which, my friends tell me – serves excellent food. The new shop is again behind the photographer's back here. 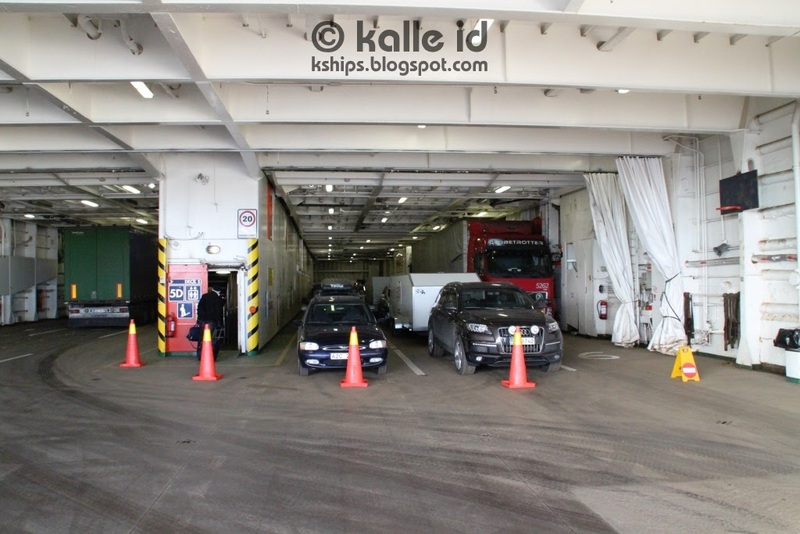 Decks 3-6 – the ship has two double-height car decks, allowing it to carry a pretty impressive number of lane metres considering what a small ship we're talking about. While the ship does actually have a bow visor and side gate that would allow drive-through operation, for reasons unknown to me Wasaline use the bow ramps in both ports. The traffic cones are here because the gangway in Vaasa was broken and we had to embark and disembark via the upper car deck. Kships, as always, will return. All photographs and other material in this blog are copyright © Kalle Id, except where explicitly noted otherwise. Photographs or text from this website may not be reproduced anywhere without an explicit written permission from the author. A Finnish maritime historian, journalist and photographer. Exposed to ferry cruising at a young age, decades later this trauma led to the creation of this blog. All material in this blog is copyright © Kalle Id except where otherwise noted. Copying images or other material from this blog is not allowed without my explicit written permission. Factual accuracy of information provided is not guaranteed. © 2010-2018 Kalle Id. Simple theme. Powered by Blogger.